Four artists have Stepped Up as Global Angels Ambassadors to run in the British 10k London Run and will also be performing in an exclusive ‘Angels In Concert’ event later that day. Ambassadors Rachel Furner, Larissa Eddie and Raphaella will run alongside 30 ‘Angels’ this July 10th, raising money for Global Angels’ 100% Projects to provide water, education, food and resources for street-kids, orphans, trafficked kids and impoverished communities in the developing world. The artists will be back, joined by John Adeleye (X-Factor finalist), to hold our one-off ‘Angels In Concert’, hosted by Tony Moore at Freedom Bar Soho. 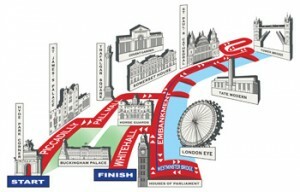 Artists and runners will perform for ticket-holders in an evening of music and to celebrate the achievements of the day! Our ‘Angels In Concert’ events are an exciting way for you to become an Angel, giving you the opportunity to join us in some amazing events that support Global Angels. Joining us for Angels In Concert is just one of the ways you can be involved in the buzz and excitement of the 10k Run day: All of our Angel Runners have their own fundraising pages, detailing which 100% Project they are raising money for. Check them out and sponsor a runner! If you aren’t running on the day, you can still get involved! By visiting the Angel Runners group page, you can choose to donate to any of our runners; check out their individual fundraising pages to find out exactly what they are raising money for. The race route through the heart of this historic capital city is unrivalled anywhere in the world and takes runners past many of the iconic and most world renowned sights that the great city of London has to offer.